I am finally using up the last of the bread, bologna, and cheese from our camping trip last weekend. These two happy sandwiches are hanging out with red pepper slices, cherry tomatoes from the Sebastopol Farmers Market, steamed romano beans from The Patch in Sonoma, two cherries, and a few blueberries, also from the Sebastopol Farmers Market. I had a great Fourth of July celebration with friends, complete with BBQ and pool time. 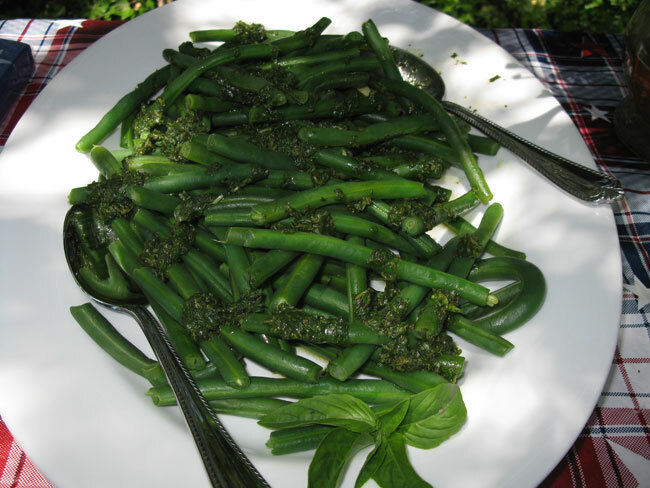 I brought along these steamed green beans topped with a lime infused olive oil and basil dressing. They turned out great! Steam green beans for 7 to 10 minutes. Run beans under cold water to stop them from over cooking. In a food processor, combine basil, grated garlic cloves, olive oil, salt, and pepper. Blend dressing. Spoon dressing over beans. Serves 10 as a side dish. *If you don't have lime infused olive oil, use regular oil and add a bit of grated lime zest and a tablespoon of lime juice. Thanks Susan! The beans were a hit at the 4th of July party, and super easy to make. They would also make a good bento ingredient, but you would have to put them in a liner so the dressing would not get on everything else. Fresh and lovely green beans recipe, cute his and her sammies...fun post, SB! Thanks Bentobird! 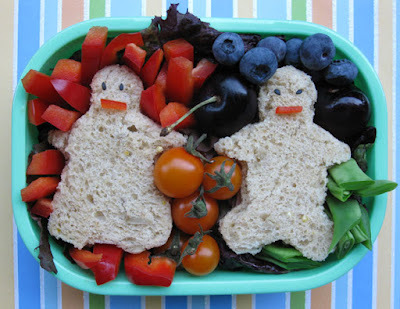 I saw these cookie cutters and knew they would make a fun themed bento.